Hurricane Michael slammed into Tyndall Air Force Base in Florida as a Category 4 storm on Wednesday, causing extensive damage and leaving the base closed until further notice. 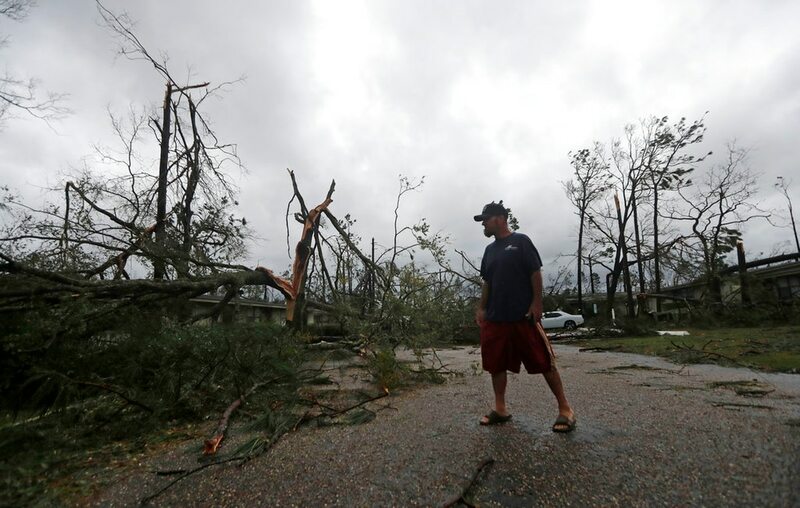 Tyndall said in a release Wednesday evening that the “catastrophic” storm delivered a direct hit to the base, bringing down trees and power lines, ripping roofs off buildings and causing significant structural damage. Michael’s winds topped 150 miles per hour. Tyndall is near Panama City, Florida, which bore the brunt of the storm. No injuries have so far been reported, the base said, but the condition of Tyndall’s runway is not yet known. Air Force spokeswoman Erika Yepsen said in an email Thursday afternoon that Tyndall currently has no power, water or sewer service. The Air Force is working on aerial surveillance of Tyndall to assess the damage, clearing a route to the base, and providing security, potable water, latrines and communication equipment. Yepsen said all personnel assigned to ride out the storm at Tyndall are accounted for and uninjured. But other airman who are assigned to Tyndall should not plan to return at this time, she said. The Air Force also said in another email that nearly every home at Tyndall has roof damage, and recovery teams found “widespread catastrophic damage” as it conducted initial assessments of the base and portions of base housing. Tyndall’s mandatory evacuation evacuation order, which was declared Monday, remains in effect. Eglin Air Force Base and Hurlburt Field, both near Valparaiso, Florida, appeared to avoid the worst of the storm. Eglin said Wednesday that it will remain in limited operations on Thursday as it recovers and restores essential services. All other civilian and military personnel are authorized to return to their normal work schedules on Friday, Eglin said. Hurlburt officials also said the field will be on limited operating status Thursday, and is expected to go back to normal operations Friday. Air Mobility Command also said Thursday morning that it is positioning aircraft to offer assistance, if required. Scott Air Force Base in Illinois has critical care air transport and aeromedical evacuation teams on standby, AMC spokesman Col. Christopher Karns said. And C-17s from Travis and McChord Air Force bases, and C-130Js from Dyess, were also being positioned to provide support if necessary.